The stories here are considered the year's best SF/F because they have been recommended by one or more prolific reviewers👍, included in a "year's best" anthology📙, or are finalists for one or more awards🏆. Each story shows a "Recommended By" list where a score is tallied from the +2, +1 or +0 after each recommendation. This page starts as the "Year-To-Date" list and is updated the first of each month with recommendations from prolific reviewers. After a year, it becomes the "Hugo Awards" list and is updated through the Hugo nomination period with "year's best" anthologies and award finalists such as the Nebulas. When Hugo nominations close, it becomes the "Best SF/F" list and is updated with later awards like the Eugie and Sturgeon as well as the Best American Science Fiction & Fantasy anthology. Update 3/5/18: Used new dynamic tables. Update 3/2/18: Added links to 7 Analog's stories from 2017 AnLab Readers Awards finalists. Update 2/26/18: Added link to free F&SF story "Dirty Old Town". Update 2/23/18: Added links to 11 Asimov's stories from 2017 Asimov's Readers Awards finalists. Update 2/20/18: Added 2017 Nebula Award finalists. Update 2/10/18: Added recommendations for stories in RHorton's The Year's Best Science Fiction and Fantasy, 2018 Edition. Update 2/7/18: Added link to 2018 Pro Artists page. Update 2/7/18: Added links to 5 Asimov's stories; Added GDozois and RHorton recs from 2/18 Locus Magazine. Update 1/23/18: Added recommendations for stories in NClarke's Year's Best SFF v3. To make it easier to nominate in Hugo Award categories other than Best Novel, we have collected key information from all the stories in 11 magazines and 8 major anthologies published in 2017. Taken together, this makes it a lot easier to pick things to read and nominate in five categories and the Campbell Award. 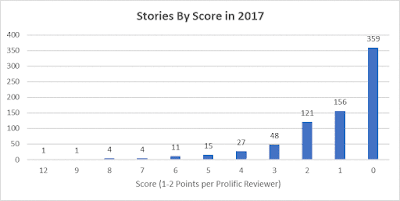 The recommended stories by 192 authors from 22 publications are sorted by a "recommendation score" calculated from seven prolific short-fiction reviewers. Each entry includes a link to the story or information on how to buy or borrow a digital copy of the back issue of the print magazine or anthology. 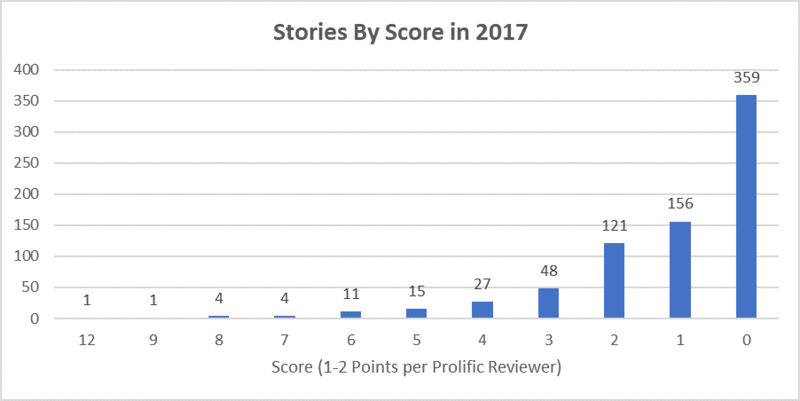 If you just want to read without regard to story length, see the Year-To-Date by Rating, Score, and Magazine pages. 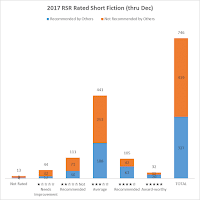 There are also the RSR-compilation of the "year's best" SF/F anthologies, RSR-annotated versions of the 2017 Locus Recommended Reading List and 2017 Nebula Award Finalists. It's easy to remember which novels you read last year, but it's hard to remember all the short fiction. Even a list of titles and authors doesn't always help because that's often not enough to remind you what the story was about--much less whether it was a novella, novelette, or short story. Here are links to lists of stories in every magazine and anthology reviewed by RSR in 2017. The stories are sorted by title and contain a brief description and category (novella, novelette, short story). The Campbell Award goes to the best new writer based on the last two years of work. The challenge here is knowing who's eligible. Our Campbell Award-Eligible Writers page contains the same information per-story as the list above, but filters out all but the new writers. To pick candidates for Best Professional Artist, you need to be able to look through a lot of full-sized images quickly, separating out the ones worth more study. Our 2018 Professional Artists post uses a "lightbox" display to let you scroll through the cover art from the major magazines and novels of 2017, and it includes links to the original publications and the artists' online galleries (where possible). With this system, you can riffle through about 300 pieces of cool art in just a few minutes. Finally, to help people make nominations for the Best Editor (Short Form) category, we collected together all the statistics we could think of on our 2018 Editors (Short Form) post (coming soon) and we offer some suggestions on how to combine them to pick candidates. Worldcon 76 will be held in San Jose, California, USA from August 16-20, 2018. Worldcon 77 will be in Dublin, Ireland in 2019. 2018 Hugo Awards nominations will begin soon. To nominate, you must have either 1) been registered for Worldcon 75 (Helsinki, Finland) or 2) registered for Worldcon 76 (San Jose, California) or Worldcon 77 (Dublin, Ireland) before January 1, 2018. Update 8/23/18: Tagged 20 Best American Science Fiction & Fantasy 2018. Update 5/21/18: Tagged 5 Eugie Award finalists. Update 4/30/18: Tagged 30 Locus Award finalists. Update 4/17/18: Tagged 11 Sturgeon Award finalists. Update 3/31/18: Tagged 18 Hugo Awards finalists. RSR's tables are now dynamic, meaning you can change the way the stories are ordered, and also highlight different types of stories. For example, click this link 🌀Publication & Score to regroup stories from categories to magazines. Click these links to highlight stories that are 📖free online, by ✍new writers (Campbell Award-eligible), and 🌐translations. 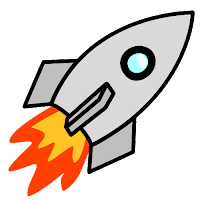 You can also flag and rate stories to track your reading progress over weeks and months and end up with a shortlist of candidates in the ⚑★My Ratings page at the end of the year to nominate for the Hugo, Locus, Nebula, and various magazine-specific awards. When you're ready to try the new features, expand the Dynamic Table Features help box below for further details, and expand the gray Command Box pinned to the bottom of the window to access all the new functionality. Impressive grading system! I would probably rate Night Passage by Alastair Reynolds a bit higher, but I'm a Reynolds fan so I'm biased. Stories that are only available in anthologies tend to suffer a little, partly because people aren't willing to buy a whole anthology just to read one or two stories. Amazon really needs to come up with a way to let readers buy individual short stories from magazines and anthologies.